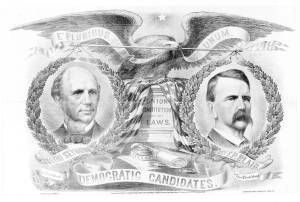 A campaign banner for Seymour and Blair. Medallion portraits of the candidates are framed with oak branches and hang from a staff held by an American eagle. The eagle carries a streamer with the words, "E' Pluribus, Unum" and sits on a pedestal partly covered by an American flag. On the pedestal is inscribed, "The Union, Constitution and the Laws." At its base lie a Phrygian cap, the Constitution, and the scales of justice. At the top, above the eagle, is a single star.